Painted body kit. 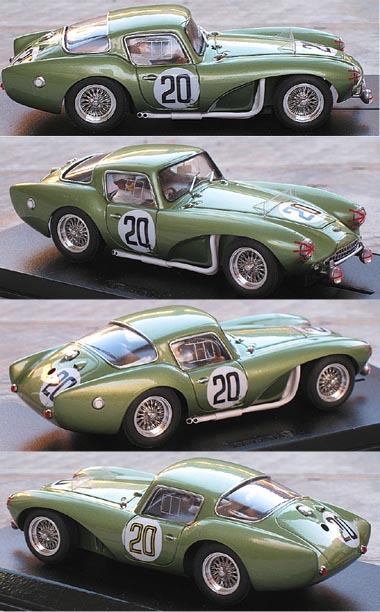 model of car raced at LeMans in 1955. Need a chassis for this body? See all the available universal chassis HERE. In that category you will find a variety of chassis manufactured for the purpose of building complete cars from body kits. We have tried to include in the product page for each chassis as much manufacturer's information as possible, but this is often somewhat scant. In general, your best option is to select a chassis with adjustable wheelbase so you can simply set the wheelbase to fit the body. Also, the narrower the chassis, the wider the wheels and tires you will be able to fit under any given body. Unfortunately, because of the large selection of choices offering different performance levels and price points and because we do not have direct experience with your specific combination of track layout and surface condition, power, and racing rules we are unable to "spec" a complete car build for you. We will, however, try to answer any specific technical questions you may have. NOTE: The body in this kit is painted in the overall body color. Kit will require additional painting to complete as shown.